A marble honour roll commemorates those who served in World War One. On either side of the honour roll are some William Longstaff prints which are framed in timber from the first H.M.A.S. Sydney. There are burn marks which can still be seen in the wood from the battle with the German raider "Emden" in November 1914. 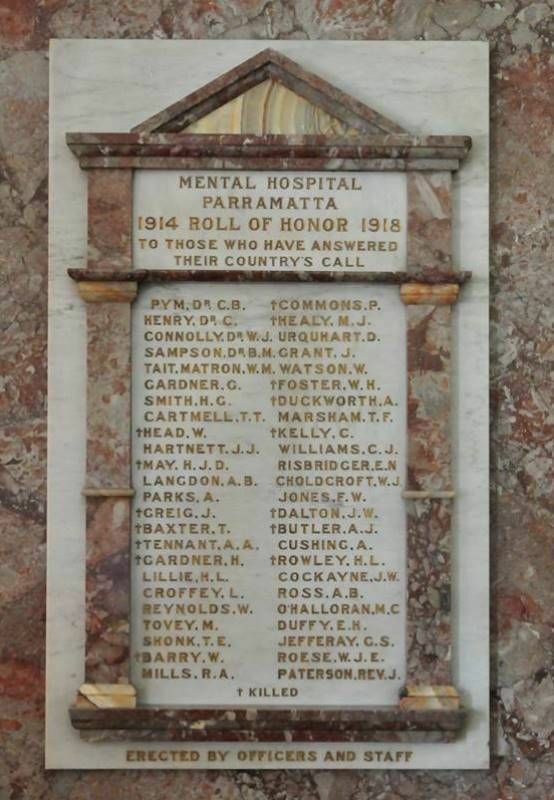 Not far short of 500 ladies and gentlemen witnessed on Thursday the most impressive and reverently-conducted ceremony of unveiling a memorial tablet at the Parramatta Mental Hospital to the brave men who went forth from the institution to serve their King and country in the great war. The effort, and the way it was carried out, was one worthy of the men and women on the staff of the hospital, who could no leave their posts here, and the tablet is really beautiful in design and execution. It is composed of white and red marble, the lettering being carved in letters of gold. For the ceremony the memorial was placed in what would be regarded as the chancel when religious services are being conducted in the magnificent hall. Grouped in front, as a guard of honor, were the soldiers of the institution, in khaki, who had weathered the storm and stress of the war. On the dais were: Dr. W. C. Williamson, president of the memorial committee; the Mayor of Parramatta, Mr. L. A. Simpson, who was accompanied by the town clerk, Mr. S. Davies; Dr. Pym and Dr. Latham (two returned officers), and the Rev. Hilhouse Taylor, who had been asked to perform the ceremony. The centre of the hall had been kept clear, the spectators being accommodated along the sides, and the imposing proceedings were opened by the returned soldiers marching from the opposite end of the hall to a place in front of the memorial at the eastern end. Here they formed a hollow square, while Dr. Williamson, from the stage at the rear, briefly explained the object of the gathering. He said they had met to do honor to their returned soldiers and to the brave men who would never come back. They were all proud to have their men back. That they knew something of the dangers and perils through which they had passed was selfevident by the large number of men who had not come back. To the relatives of those heroes they extended their utmost sympathy. The Dr. then requested the Rev. Hilhouse Taylor to unveil the roll of honor.